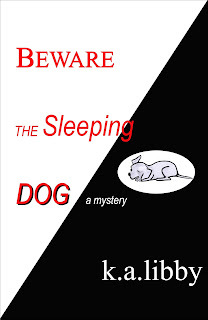 “Beware the Sleeping Dog” is Karla Reidinger’s (k.a. libby) first novel. It hibernated as a tiny germ of an idea for years before she actually started writing the manuscript. Much like George Bernard Shaw's quote above she had an idea. She imagined its growing into a novel. She studied her favorite authors and learned how they developed the goals, obstacles and stakes for their characters. She wrote her novel and re-wrote it. And re-wrote it. And re-wrote it one more time. And now it's ready for you to read. She hopes you will enjoy the experience of reading it as much as she has enjoyed the adventure of writing it. 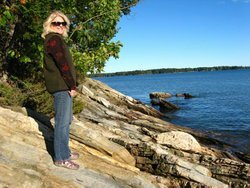 She is now working on her second novel in the trilogy. 1.Persevere. Writing a novel is hard. Very, very hard. Period. I’m writing my second novel and I’ve hit a wall. But because I succeeded once, I have confidence that this wall can be breached. I’ll keep picking (or pecking) away until I’m through it and on my way to a good (great?!) finish. 2. Edit (and be edited). It’s laborious. Necessary. Painful. And all about deleting. Refining. Finessing. Again and again and again and again. Phew. 4. Be realistic. No one can possibly compensate me monetarily for my time and effort. My compensation is knowing that I have completed my task and that it is a ‘job well done’. But I joyfully embrace any and all kudos! Thank you to the kind and generous souls who not only bought and read my book but also spoke well of it. Good read. I like the fact that it was full of suspense and intrigue, but was not overly violent or gory. Looking forward to reading more books by this author! Really liked the character development as well as the writer's descriptions of scenery, conflicted emotions, and untangling of old business. 5. Remember: many try, but few succeed. Hurrah to all who write, finesse, and publish. Keep up the battle. Word-by-word. Page-by-page. Chapter-by-chapter. A journey from guilt to retribution to forgiveness. Professor Mavis Walker has a stalker. Who would target her? And why? Her struggle to discover the answers and end the terror triggers closure of another kind as well. I learned when I start changing things back to the way they were in the first draft, I'm done! I do like editing though. Good tips, KA! I've learned to embrace editing, but it took a while to develop the relationship. If I get good feedback from a reader, I actually enjoy improving the work. This is an encouraging post that also emphasizes the realities of writing.